On my to-do list is to build a patio table for the backyard. I posted about that here. I had to put this project on the backburner because we ended up having to use the bed slates for our new bed. Long story. 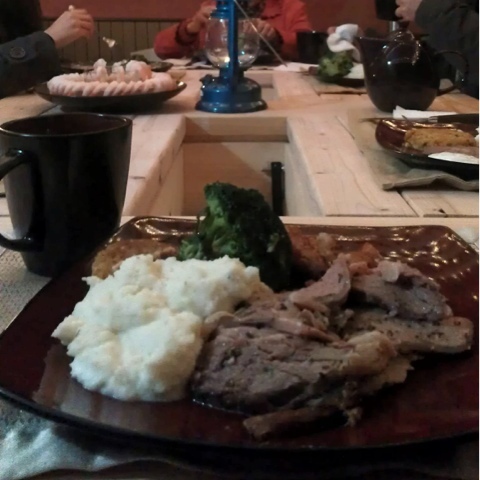 On Christmas day, we decided that we’re going to celebrate New Years Eve with dinner at home. All of a sudden, we had to build a patio table in less than a week. 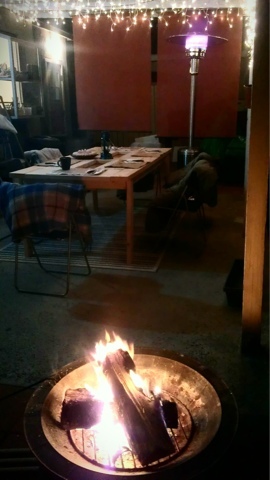 I search the web and found this patio table by Domesticated Engineer. I wanted to build a bigger version of her table so I had to change the design a little and update the measurements. Our table ended up being 7′ 1″ x 3′ 4″. This is the first time we’re using our miter saw. We made all the cuts at home. I sanded everything down. 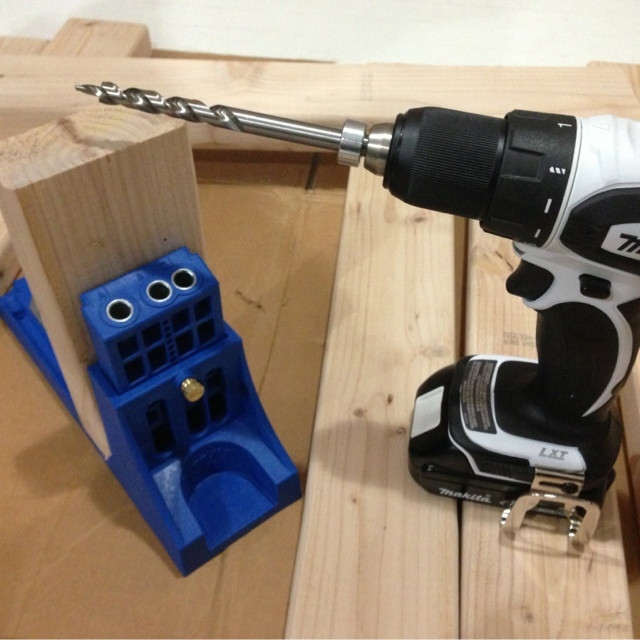 This is also the first time we’re using the Kreg Jig. Yea, we’re ambitious. I used a test piece of wood for my first try. Works perfectly. Using the Kreg Jig, I drilled two holes into both ends of the of the 10 (C) boards and 2 (B) boards. 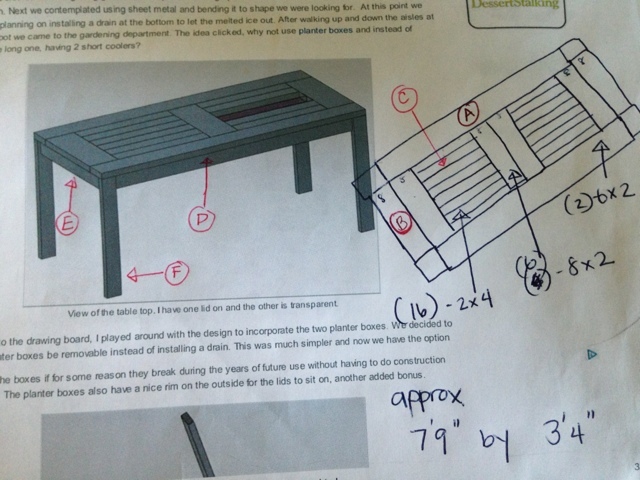 Then I assembled the table top with the (B) and (C) boards according to my sketch of the table top in the picture above. 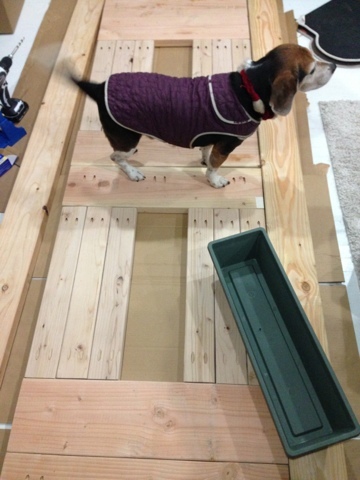 KT helped me screw the (C) boards to the (B) boards (without the Kreg Jig holes) with 2-1/2″ wood screws. (We had to get rid of the 2nd (B) board in the center because I couldn’t figure out how to support that extra piece without making the table significantly more complicated and heavier). Taking the other two (B) boards with Kreg Jig holes, screw them to each end of the table top to the other (B) boards. Next, I built the boxes to hold the plastic planters. 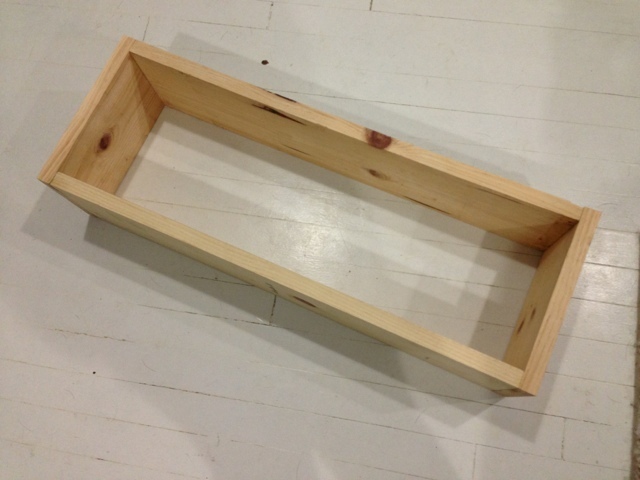 I used wood glue and 2″ nails to attach the long box sides to the short box sides. Once I had the box frames, I spaced out five pieces of the box bottom in each box. 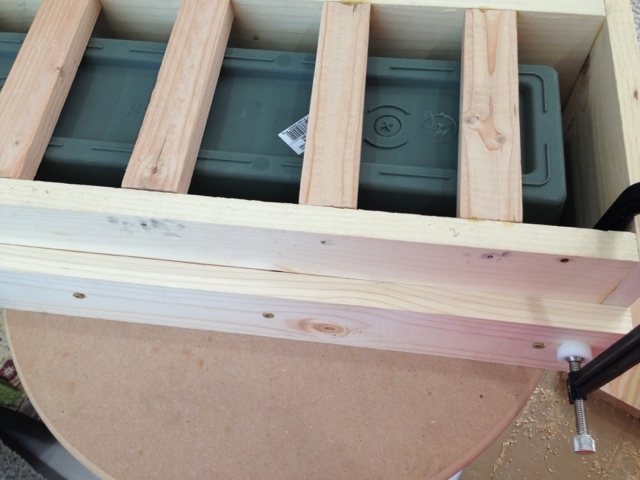 I glued the box bottom pieces in place and nailed them in with 2″ nails. At this point, I’ve been working Friday and Saturday on this table. On Sunday, we had an expected downpour of rain so I had to move everything in doors. Monster is my little helper. 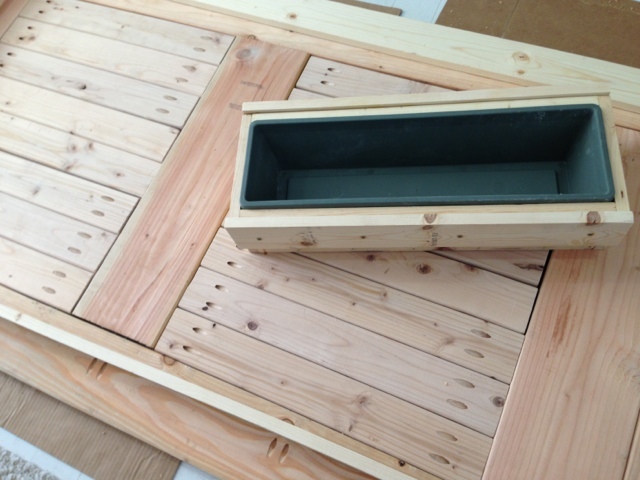 Once the support box is built, place the plastic planter box into it. Turn it upside down on a flat surface. 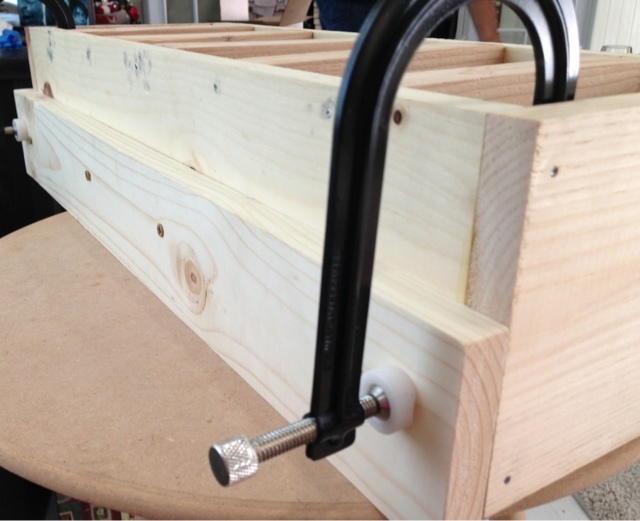 The plastic planter box will protrude out of the support box by about 1/4″. Take two of the box support boards, sit it flush on the flat surface, and glue it against each long side of the support box. 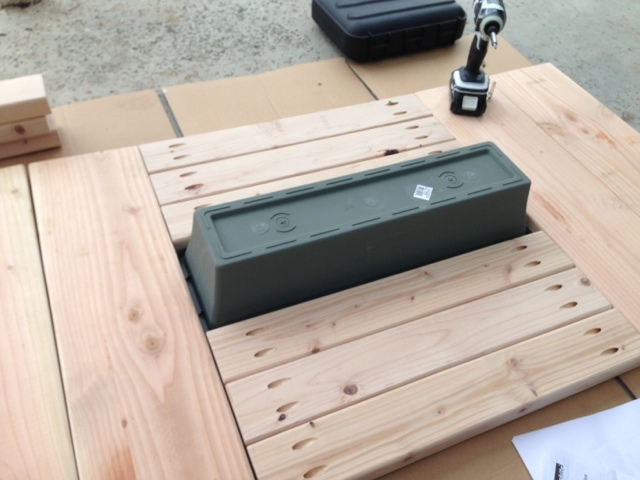 I used clamps to hold it in place and 1-1/4″ screws to attach the box support securely to the support box. 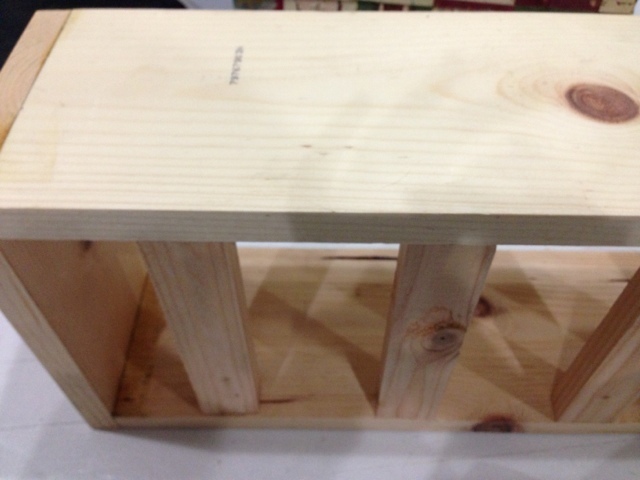 This is how the support box with the plastic planter box inside looks upright. Using the Kreg Jig, I drilled some holes into the (A) boards. With KT’s help, we attached (A) boards to the (B) and (C) boards with 2-1/2″ screws. 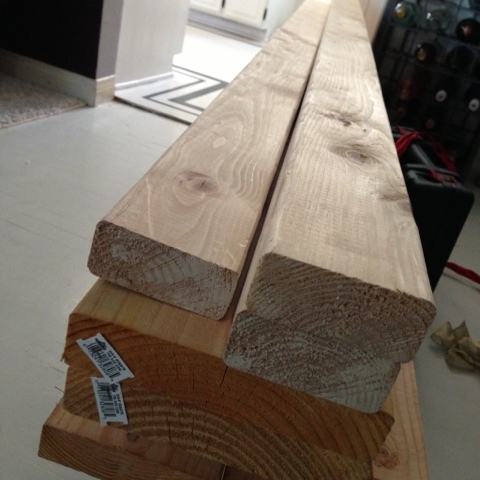 On Monday, I place down (D) and (E) boards and cross beams on the table top. I eyeballed where the (D) and (E) boards need to attach on the table top. I used the cross beams to center everything. I marked out where I need to screw the (D) and (E) boards to the table top. 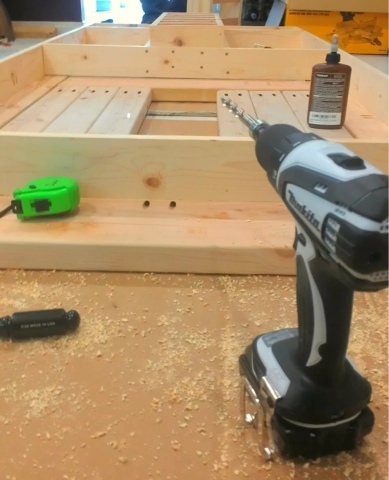 Using the Kreg Jig again, I drilled the screw holes into the boards and attached the (D) and (E) boards to the table top with wood glue and 1-1/4″ screws. 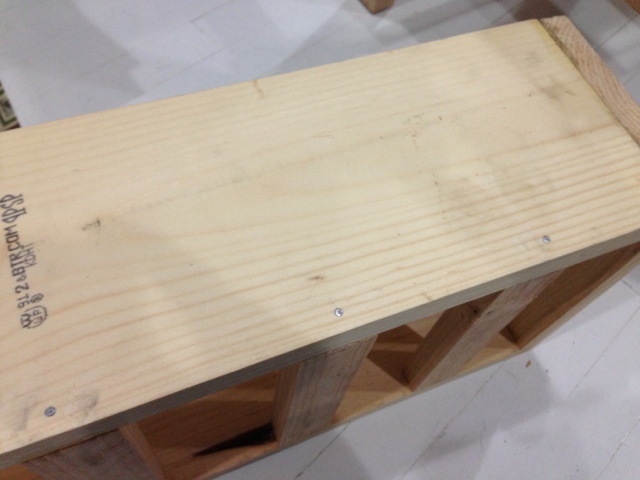 I attached the cross beams to the support box with 1-1/4″ screws. Then attached the cross beams and support boxes to the table top with wood glue. We decided to use the 2-1/2″ screws to attach the cross beams to the (D) boards. The final step is to attach the legs to the table top. We used 2″ screws to attach the legs (F) to the (D) boards. We’re going to attach 4 more legs to the (E) boards (see picture below) but we didn’t have time before our New Years Eve dinner. Here it is. We finished the year with a bang. =) We’re going to add more support to our super heavy table. I’ll finish it with either paint or stain. Then weather proof it. 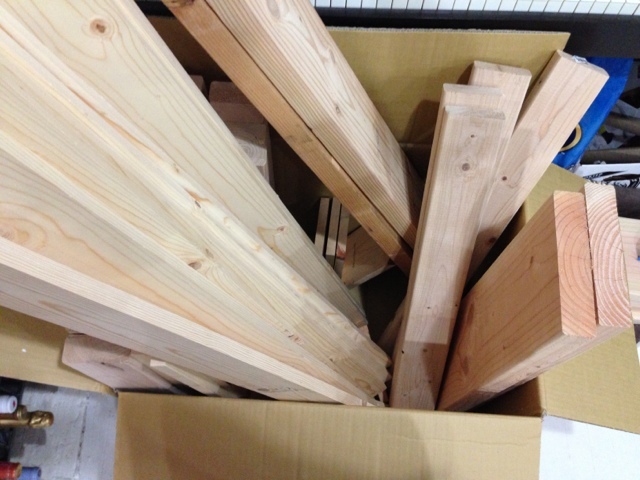 If anyone is keeping count, I still have four pieces of the (C) boards that will cover the planter boxes. I haven’t decided how to finish that yet but check out the Domestic Engineer to see how she finished it. It turned out really well even with the time crunch. KT really kept me sane during this process. It wasn’t as easy as it looked (at least it looked easy to me at first). (3) A 2×4 is really 1.5×3.5. A 2×8 is really 1.5×7.5. Etc. 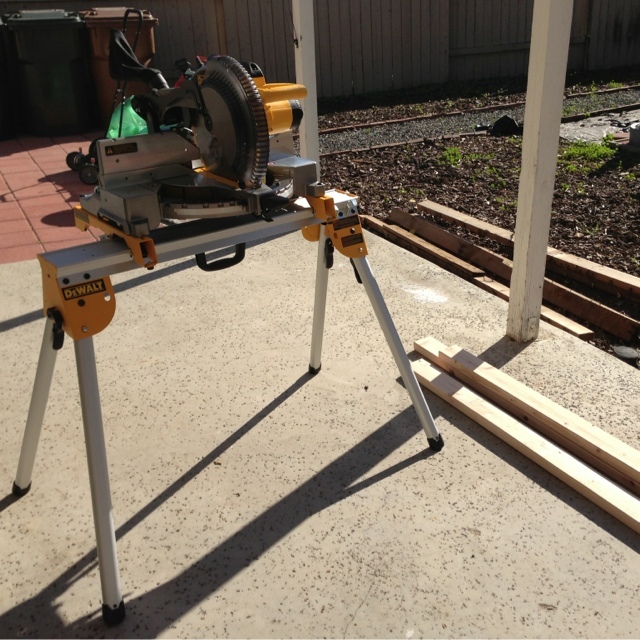 (5) The miter saw takes off maybe a millimeter or two from the wood during the cut. 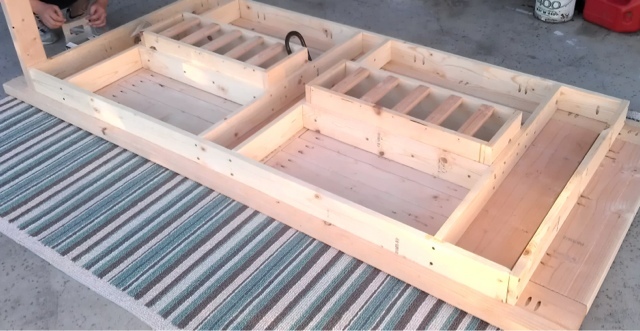 This entry was posted in backyard long haul., little old bungalow, Weekly Progress and tagged build, how to, patio table, wood table.